Arizona State University began replacing the trees on its iconic Palm Walk on Monday. The most-photographed place on campus is having its 110 Mexican fan palms replaced. The trees, which have gazed down over millions of students during the last century, are being swapped for new trees in three phases between now and the summer of 2018. This week, a crew of about 30 workers began removing the first section of the alley of 65-foot palms. The work began at the south end of Palm Walk. Replacement trees are slated to arrive Friday, according to university officials. The university is planting date palms in place of the Mexican fan palms. They will provide more shade than the fan palms do, as well as Medjool dates, which will be collected each year during the annual campus harvest. The history of Palm Walk dates to the time of Arthur John Matthews, the first president of what was then known as the Tempe Normal School. Matthews was very interested in beautifying the campus — it was, after all, a former cow pasture in the dusty desert. The first palms likely started as potted plants. The idea to create an iconic centerpiece for campus didn't originate for about a decade more. The complete history of Palm Walk is a fascinating tale complete with death, rebirth and mystery. Officials hope to have the new trees in place during the first week in August; after some irrigation work, Palm Walk is scheduled to reopen around by the time fall-semester classes begin in the middle of the month. Sunrise over Palm Walk on Monday morning. Video by Ken Fagan. From technology and talent recruitment to public relations, three Arizona State University alumni have discovered how entrepreneurship is elevated through human communication. In April 2016, the ASU Alumni Association celebrated the achievements of distinguished alumni leaders who have established successful businesses across various industries. 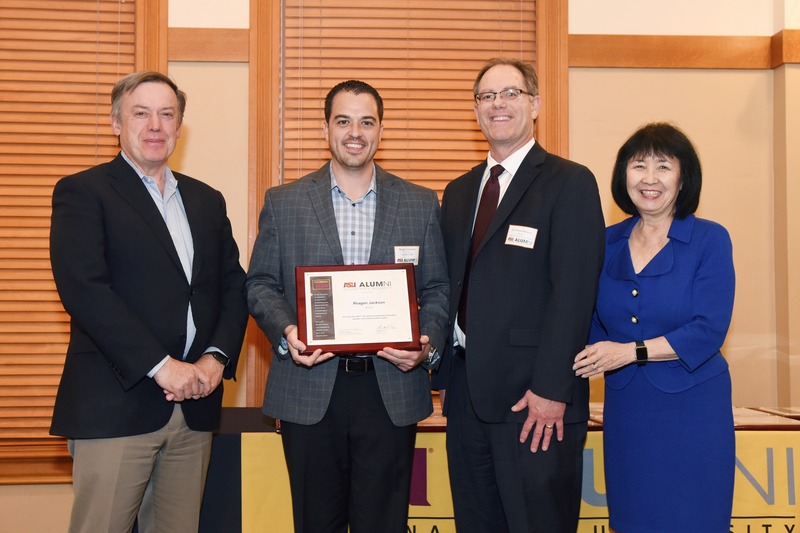 Nineteen organizations were honored with the Sun Devil 100 (formerly Sun Devil Select) award for demonstrating innovation, growth and entrepreneurial spirit. Among the winners included three communication majors — Charles “Reagan” Jackson, Jennifer Kaplan and Kathleen Duffy Ybarra — from the Hugh Downs School of Human Communication in the College of Liberal Arts and Sciences. In 2004, Jackson graduated from the university and moved back to Texas with his wife Lynde, who was also a communication major. He started selling office supplies and information technology services and products with a partner. The business venture grew from the two partners to more than 40 employees in four different technology-related divisions: computers, electronics, communications and security. CEO Etc. provides high-speed Fiber internet in virtually any location, including rural areas with limited access. In addition, the business works with restaurants and retail to offer everything from network configuration and digital signage to audio, security and surveillance systems. Kaplan, a graduate in the class of ’96, used her communication degree with an emphasis in public relations to start her own firm Evolve Public Relations and Marketing in Scottsdale, Arizona. Evolve Public Relations and Marketing helps businesses grow their brand through communication and marketing strategies. Past and present clients include Chompie’s, LA Fitness, PetSmart, Sprinkles Cupcakes and Windsor Square Historic District. Kaplan said she continuously challenges herself and her team to think outside the box and stay current with industry trends to revolutionize traditional practices in public relations. Similarly, Ybarra wanted to pursue a career public relations or human resources but her unique skill set in recruiting took her down a different career path after graduation in 1981. After spending eight years as the director of research at Tirocchi-Wright, Inc. — an executive search consulting firm — Ybarra started her own business Duffy Group Inc., a global research and recruitment firm, in 1991. Unlike traditional recruitment firms, Ybarra’s business utilizes a cost-effective model that works in billable time rather than by a percentage of the candidate’s salary, which puts the recruiting budget in the hands of the customer. In addition, Ybarra said she wants to be remembered as the biggest Sun Devil supporter and encourager of people to stay connected to the university. Her daughter and second-generation Sun Devil Teresa just graduated with a Bachelor of Science in communication. She’s following in her mother’s footsteps and has a position in recruitment at HonorHealth. “You’re always honored to be recognized by your alma mater, especially for starting something and having it be a successful enterprise,” said Ybarra.